Discussion in 'UFOs, Ghosts and Monsters' started by Magical Realist, Jun 1, 2017. Note the standard attempts by skeptics to explain away this event. The planet Mercury.. A fireball..A new test aircraft from the military base..None fit the facts of these eyewitness accounts..
"A crowd of around 10,000 has gathered to watch. Among them is Gigi Boni (second left in the picture) a lifelong Fiorentina fan who in later years would become the co-ordinator of the club's supporters group. Now in his eighties Boni still has vivid memories of watching in disbelief as UFOs hovered above the stadium. "I remember clearly seeing this incredible sight. They were moving very fast and then they just stopped. It all lasted a couple of minutes. I would like to describe them as being like Cuban cigars. They just reminded me of Cuban cigars, in the way they looked." The stadium fell silent as the players and fans stood transfixed, staring at these strange objects in the crisp blue autumn sky. Boni has spent many years re-living that day in his mind. "I think they were extra-terrestrial. That's what I believe, and there's no other explanation I can give myself." Almost 60 years later Boni and three of the players have returned to the Stadio Artemio Franchi for the BBC's World Football programme. Ardico Magnini is something of a legend at Fiorentina. He was a key player in the Fiorentina side of the 1950s and also played for Italy at the 1954 World Cup. "I remember everything from A to Z," Magnini recalls. "While we were playing the match everything came to a stop because everybody was looking up at the sky intensely. "It was something that looked like an egg that was moving slowly, slowly, slowly. Everyone was looking up and also there was some glitter coming down from the sky, silver glitter. "We were astonished we had never seen anything like it before. We were absolutely shocked from the moment we saw it." So, was it aliens? Pistoiese players Romolo Tuci and Ronaldo Lomi have no doubt that it was. Tuci, still sprightly in his seventies, feels blessed to have witnessed such a strange event. "I was so curious and I was also so, so happy because in those years everybody was talking about aliens, everybody was talking UFOs and we had the experience, we saw them, we saw them directly, for real." And he's certain that what he saw came from another galaxy. "Really I believe so. We were at the stadium and we saw them. It was such a great thing to see." In the 1950s Fiorentina were one of the best teams on the planet. The following season they easily won their first ever league title, finishing 12 points clear of AC Milan. 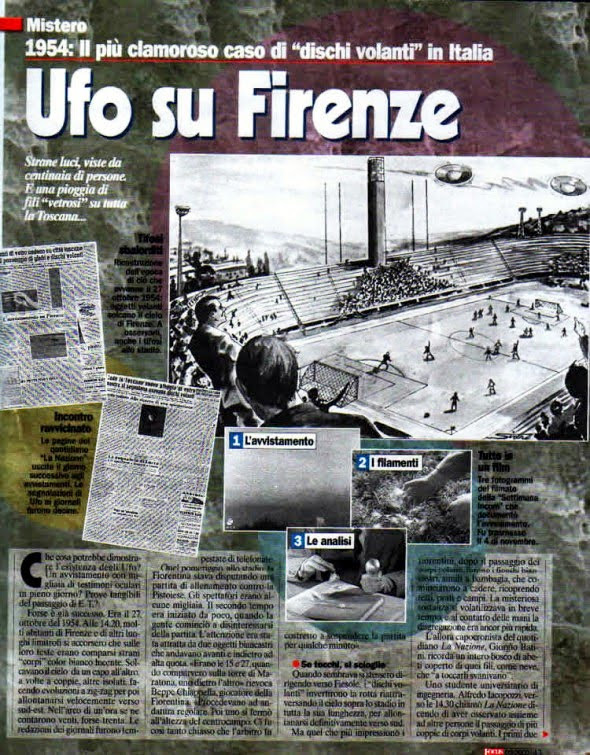 So, if a visitor from a galaxy wanted to enjoy a game, Florence was a very intelligent choice. But, football loving aliens? The truth remains a mystery"